Stokes gets a huge slice of luck thanks to the law 31.7 which came into force in October 2017. 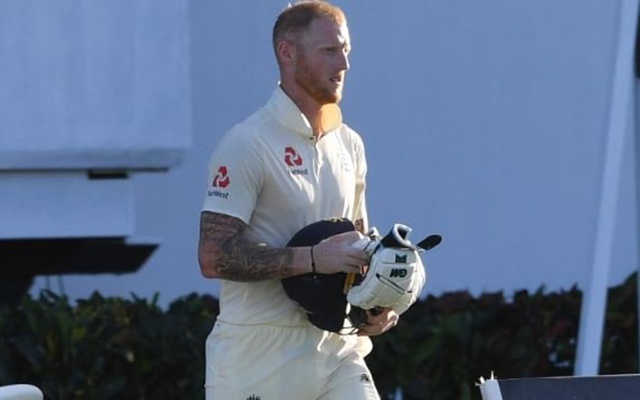 The third and final Test match between England and Windies got underway on Saturday at the Daren Sammy National Cricket Stadium in St. Lucia. The visitors were down and out coming into this game and the Caribbeans hoped to blow them away on a greenish surface. But despite being in trouble 107/4 at one stage, England ended the day on top courtesy Ben Stokes and Jos Buttler. Things could’ve been different had Stokes been not called back by the umpires from the pavilion in the last session in a dramatic way. The incident took place in the 70th over when Stokes hit one straight back to Alzarri Joseph and the bowler did exceedingly well to hold on to a brilliant catch. He had just reached the half-century then and walked back in disbelief after bailing the team out of trouble. However, there was more drama on its way and Stokes has to thank the new set of rules introduced by the ICC for that. The on-field umpires belatedly decided to check the front-foot of Joseph and to everyone’s surprise, the bowler had overstepped and it was no-ball. But Ben Stokes, by then, had reached the dressing room and was sitting in disbelief pondering over his dismissal. The umpires, meanwhile, after watching the replays and ruling it a no-ball decided to call back Stokes from the dressing room. Under the old laws, the batsman departing from the field would’ve ended the matter even after knowing that the bowler has bowled a no-ball. The MCC, in April 2017, decided to define the law 31.7 which governs the status of batsmen “leaving the wicket under a misapprehension”. “A batsman may be recalled at any time up to the instant when the ball comes into play for the next delivery unless it is the final wicket of the innings, in which case it should be up to the instant when the umpires leave the field,” the law reads. This law came into force in October 2017 and Ben Stokes became the first player to benefit from it. “I’ve never been in the changing room and called out to bat again, that is a first for me and it’s probably something that they need to get control of. I don’t think in international cricket you should be walking off and being in the changing rooms and then being back out there two minutes later. Thank God for technology,” Stokes said of the bizarre incident after the end of the day’s play.